We admit it: We're spoiled. With the state's always-improving ski resorts so accessible, we've got the best winter trips right in our own backyard. Photo by Matt Powers. Courtesy Aspen Skiing Company. Terrain breakdown: Aspen/Ajax: beginner: 0 percent; intermediate: 48 percent; advanced/expert: 52 percent; Aspen Highlands: beginner: 18 percent; intermediate: 30 percent; advanced/expert: 52 percent Buttermilk: beginner: 35 percent; intermediate: 39 percent; advanced/expert: 26 percent. What makes Aspen special: The celebrities! The private jets! If your dream of a perfect ski weekend is running into a Hollywood star on the chairlift (“Hi, my name is Mariah. What’s yours”? ), this is the place. What’s new: To celebrate the 60th birthdays of both Buttermilk and Aspen Highlands, the resorts are offering $60 lift tickets April 1–21; you need to buy a minimum of two days of skiing and book with lodging. And Buttermilk has built a new frontier-style Fort Frog play structure for kids. Getting there: United, American, and Delta all have direct flights to the Aspen-Pitkin County Airport, which is a mere five minutes from Buttermilk and 10 minutes to Aspen Mountain and Snowmass. Extras: The Aspen Snowmass App helps guests get the latest mountain conditions, keep track of skier days and vertical feet skied, and learn about lift tickets, lessons and more, and this year, the app provides rewards (including discounts at select stores and credits for lessons) for year-over-year stats. Special dates: History Ski Tour, Feb. 1, Feb. 22, and March 29; Senior Day, Feb. 7; Kick Aspen Big Air, March 22; the Grand Traverse ski race from Crested Butte to Aspen, March 28–30. What makes it special: AB’s abundance of north- and westfacing terrain, which holds onto fantastic snow, makes it one of the earliest resorts to open (usually in October) and last to close (often into June and sometimes into July). 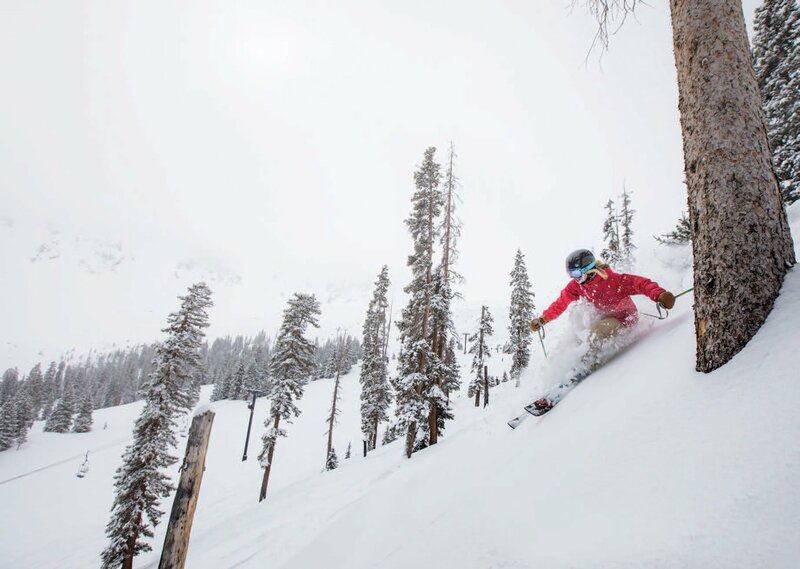 What’s new: This season, Arapahoe Basin has opened 468 acres of new terrain in The Beavers and The Steep Gullies, including high-alpine bowl skiing, tree skiing, rolling groomed runs, and steep, rocky chutes. It has also opened 34 new intermediate, advanced, and expert runs and a new four-person Beavers lift. It has invested more than $5 million in base area amenities over the last several years, including a new Kids Center, season pass office, and updated shopping and restaurants. Extras: Also new to the resort this season is a European-style delicatessen called Il Rifugio at Snowplume, where guests can enjoy antipasto, charcuterie, imported cheeses, splits of wine, and a selection of imported beers—all with high-alpine views in every direction. Special dates: Moonlight dinner series: Feb. 23 (Spanish cuisine), March 23 (French cuisine), April 20 (Hawaiian cuisine); Save Our Snow Demo Day, March 30; Enduro Light Day 1, April 10, and Day 2, April 13. What makes them special: Forty percent of Breckenridge’s skiable area is high-alpine terrain, and mountain guides can take skiers above tree line to scout out the best terrain. (Breckenridge is the only place where a skier can take the highest chairlift in North America, the Imperial Express, and ski all the way down into town.) Keystone is known as superfamilyfriendly, with its Kids Ski Free program (for anyone 12 and under) and daily Kidtopia activities. What’s new: In short, more manmade snow, which means that more terrain opens more quickly. For this season, more than 50 snowguns were upgraded on Peak 9 with new, highefficiency ones. But this year, they’ve hardly been needed; with all of the snow, Breck has announced that it will stay open through the Monday of Memorial Day weekend (weather permitting) for the first time since the ’90s. Extras: This season, Keystone Lodging guests who book a Thursday evening stay can receive early lift access one full hour before lifts open. Keystone’s new Go Big Burger at the base of the Peru Express chairlift has burgers, fries, and shakes. And at Breckenridge, the new Waffle Shop at The Maggie, at the base of Peak 9, has grab-and-go waffles and a variety of toppings. And The Coop at Sevens is a new outdoor express window with chicken dishes. Special dates: Breckenridge: Breck Bombshells (for women), Saturdays throughout season; Breckenridge Ascent Series, Feb. 6 & 13, March 13 & 20; Pass Holder Appreciation Week, Feb. 3–9; Women’s Camp, Feb. 13–15; Women’s Ultimate 4 Lessons, Feb. 15–22; Ten Mile Tour & Dinner, Feb. 20 and March 18; Pioneer Crossing Campfire Series, Feb. 22. Keystone: Kidtopia Culinary Festival, Feb. 8–19, and the Kidtopia Music Experience, March 1–10. What makes it special: Copper is known for its wide-open freeride runs that are naturally partitioned into beginner, intermediate, and advanced areas. What’s new: The high-speed American Eagle lift includes new six-person chairs and eight-person gondola cabins, increasing uphill capacity by 40 percent. The new high-speed American Flyer lift will feature bubble enclosures. New high-capacity, energy-efficient Cobuses, with low floors for easy loading and unloading, are shuttling skiers to and from free lots and between the East, West, and Center villages. A new Passport Parking mobile app lets skiers pull into any parking spot in a paid lot and pay by phone. Extras: Toast & Co., opened in 2017, is offering new mixology classes on select weekends this year. Downhill Duke’s has a south-facing patio, a locally sourced menu, and live music (and dogs are welcome!). And Ten Mile Tavern offers Bingo & Beers nights (with great prizes) on select Wednesday nights. What makes it special: There’s a reason (several, actually) why it’s known as Ski Town, USA: its famed “Champagne powder” snow (due to the lower water content in it), its vaunted kids’ programs and overall “ranch town” family-friendliness, and its Olympic pedigree (Steamboat has produced more Olympians than any other U.S. town). What’s new: In an effort to make navigation on the mountain easier, resort crews replaced and relocated all on-mountain signage over the summer (a massive job requiring the cutting of 60,000 pounds of wood and 170 gallons of stain). Steamboat’s Ski Your Pass Off program, started last ski season, was such a success that it is being repeated this season, rewarding the resort’s most loyal customers for the number of days they hit the mountain. Below the new Timber & Torch in Gondola Square, Steamboat has added a permanent Ski Corral facility, with state-of-the-art racking systems, so guests can leave skis and snowboards there at the end of the day and pick them up in the morning. And next November, a new Doppelmayrdesigned gondola will debut, with new level-walk-in cabins, faster speeds, and much greater capacity. Getting there: There are three daily flights—morning, afternoon, and overnight—from Denver to Steamboat on United Express; 15 major markets now have nonstop flights to Steamboat, including new JetBlue flights from Boston; Long Beach, Calif.; and south Florida. Extras: Timber & Torch, featuring gastropub-inspired food, has replaced Bear River as the centerpiece restaurant for Gondola Square, with expanded indoor seating, a new outdoor heated patio, two indoor-outdoor bars, and an outdoor fireplace and grill. On the slopes, the Taco Beast, an on-mountain snowcat, is serving four types of trail tacos and Mexican-style beer. Steamboat Mercantile has opened in Gondola Square across from Gondola Joe’s, and The North Face Steamboat opened last fall in downtown Steamboat. Special dates: Steamboat Springs Winter Carnival, Feb. 6–10; Snowshoe Tours on Howelsen Hill Saturdays until March 16; Ski Free Sundays on Howelsen Hill until March 10; STARS Mountain Challenge, March 2; Springalicious, April 1–14. What makes it special: Let’s start with the historic town, which oozes charm out of every one of its many Victorian windows. And the celebrity component (the Kardashians aside) is—dare we say it?—discreet and un-flashy. What’s new: The Meadows, Telluride’s most popular beginner area, has been upgraded with the installation of a 320-foot covered surface lift (in which skiers stay on the ground) and a serious investment in a Terrain Based Learning program, where the slopes are uncrowded and the terrain helps naturally control speeds and assist with training. Extras: A new Telluride app includes features like weather, up-to-date snow conditions, lift status, specific trail grooming conditions, the ability to share your location or see friends’ locations on the mountain, and an option that tracks vertical feet and distance. Download the app at tellurideskiresort.com/app. 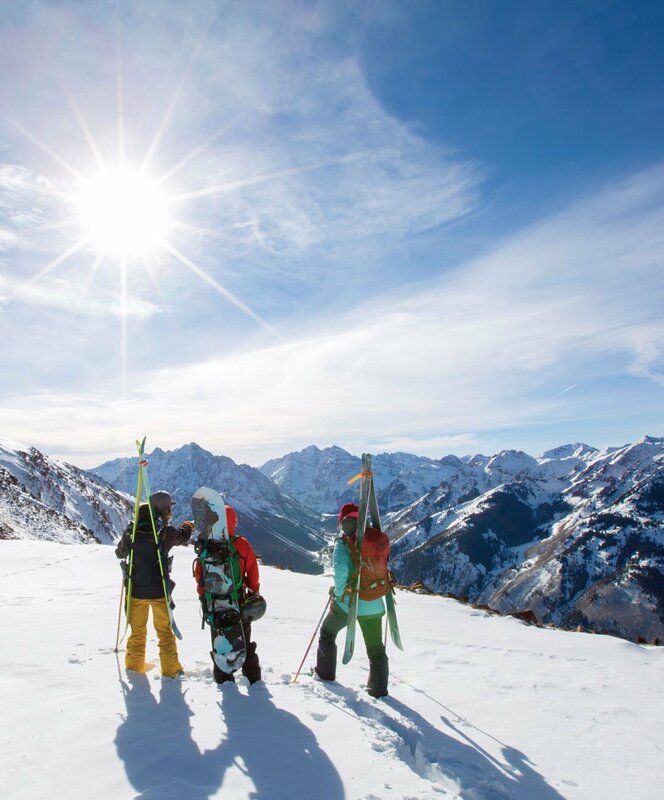 Special dates: Women’s Ski and Ride Week, Feb. 3–7; Telluride Comedy Festival, Feb. 14–17; Telluride Gay Ski Week, Feb. 23–March 2; Tellurando Race, Feb. 23; Cardboard Sled Derby, March 24; Rodney Strong Tasting at 10,000 Feet, March 23. Terrain breakdown: Vail: beginner: 18 percent; intermediate: 29 percent; advanced/expert: 53 percent; Beaver Creek: beginner: 19 percent; intermediate: 42 percent; advanced/expert: 39 percent. What makes them special: Vail’s very hugeness—including almost 200 trails and all of the amenities one could ask for— sets it apart and makes it the most popular ski resort in the country. As for Beaver Creek? Its luxuriousness and first-class extreme terrain are what keep people coming back. What’s new: Vail has installed 10 high-capacity, low-energy snow guns on the Born Free trail; that, along with upgrades to pumps mountainwide, has increased snowmaking ability. Also at Vail, the Back Bowls have seen a 30 percent increase in groomed terrain. Beaver Creek, focusing on improving its beginner terrain, has upgraded its Haymeadow Park area, with a beginner gondola and lift, magic carpets for beginner skiers and boarders, a beginner racecourse, and a learning area with small terrain features. Getting there: Hate the drive? The Epic Mountain Express runs throughout the day from DIA to Vail’s pedestrian village, and the town of Vail offers the largest free public transportation system in the country. Extras: Emma, a new digital assistant that can answer information in real time (EmmalsEpic.com), has debuted at Vail and Beaver Creek, as well as other Vail-owned resorts. Plus, the Colorado Ski and Snowboard Museum (skimuseum.net) reopened last summer after a $2.6 million renovation. Special dates: Vail Legacy Days, Feb. 15–18; Burton U.S. Open Snowboarding Championships, Feb. 25–March 2; Pink Vail (to fight cancer), March 16; Taste of Vail, April 4–6; Spring Back to Vail, April 12–14. Beaver Creek Extraordinaire Presents Spangled, Feb. 15–18 (Presidents Day Weekend); Talons Challenge (all black and black diamond runs), Feb. 23; plus almost daily shows at the Vilar Performing Arts Center. What makes it special: Snow, snow, and more snow. The family-owned Wolf Creek on average receives more snow than any other ski area in Colorado— and that translates to lots of deep-powder skiing, folks. What’s new: This season, Wolf Creek has debuted the Current Affairs Conditions Clinic, in which a discounted lift ticket is paired with a two-hour morning lesson that highlights how to ski or ride the day’s conditions. A second new series, called Tuesday Turns, pairs a discounted lift with a morning lesson that takes skiers and boarders of all abilities out on the mountain to work on technique. 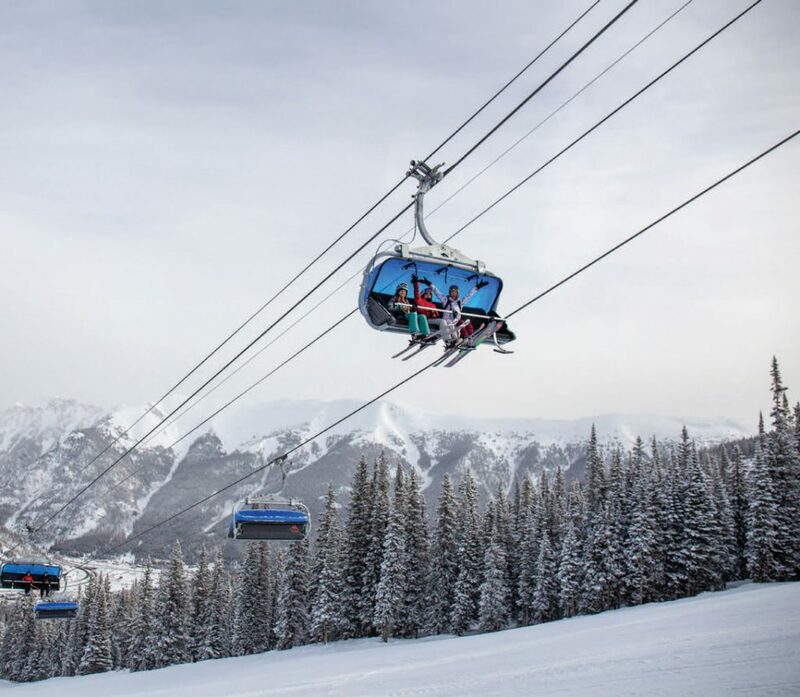 As for equipment, the Charity Jane Express, the resort’s 10th lift and a Doppelmayr high-speed, detachable quad chair, is the latest addition to the 900-acre Alberta Area, offering beginners and intermediates 55 acres of terrain previously unavailable to them. Extras: Wolf Creek prides itself on its eco-friendliness: The first solar-powered ski area, with its main source of energy the Penitente Solar Project in the San Luis Valley, the resort works with the U.S. Forest Service to cut and clean dead beetle kill pine affordably and is aiming for paperless season passes and rental forms. Special dates: College Days, Feb. 24, March 24, April 6; Local Appreciation Days, Feb. 3 & 6, March 6, 27, and 31, April 3 and 7; Jane & Pitch Tribute, March 6; Wolf Creek Challenge Series Super G Race, April 6.